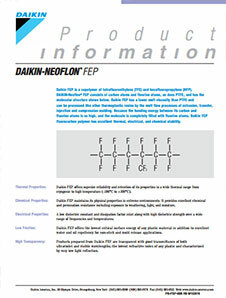 NEOFLON™ EFEP RP-5000 by Daikin is a functionalized ethylene fluorinated ethylene propylene (EFEP) copolymer grade. Exhibits high adhesion strength, excellent processability, high purity, electrical- and non-sticking properties. Offers low reactivity, chemical stability, cold impact resistance, resistance to permeation-, heat aging-, weather and chemicals. Possesses low coefficient of friction, low processing temperature and very low melting temperature. Designed for tubing extrusion and injection molding applications. 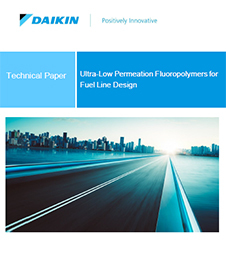 It can be co-extruded with other resins (nylons, EVOH, plastics, inorganic materials, glass, metals, modified PE, and ETFE) without adhesive or etching. NEOFLON™ EFEP RP-5000 is recommended for injection molding parts, mono- and multi-layer tubing/films, bottles and containers, automotive, chemical processing, semiconductor, film, oil and gas industries.